Is Max Pacioretty Done as Habs’ Captain? In 2014-15, the Montreal Canadiens responded to the departure of former captain Brian Gionta by naming four alternate captains – Max Pacioretty, P.K. Subban, Andrei Markov, and Tomas Plekanec. The lack of a captain didn’t hurt the team much, as they won 50 games for the first time since the Stanley Cup finalist team of 1988-89. It could be argued the sharing of duties was an audition for the captaincy the following year, but three of the four players were disadvantaged from the start. Markov seemed at the outset to be a natural candidate – he had been with the team since the 2000-01 season and earned the respect of his teammates with his stellar play and a remarkable comeback from several injuries. Unfortunately, “The General” was also a quiet man, and not overly confident in his English skills. In the case of Plekanec and Subban, both had histories of run-ins with NHL officials and were therefore not well suited for the job either, although Subban was a fan favourite thanks to his philanthropy, exuberant style of play, engaging personality. 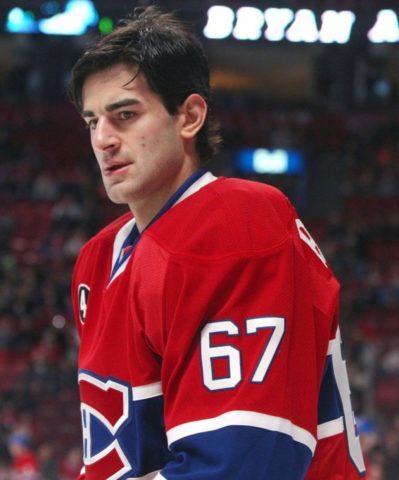 The decision ultimately went to Max Pacioretty, the team leader in goals and points and a former Masterton Trophy winner for his remarkable comeback from a serious neck injury in 2012. Serious and reflective compared to the more extroverted Subban, many wondered if he had the on and off-ice leadership essential for his new role. If the team’s record was a verdict on his performance, the initial results were not good – the team fell to a 38–38–6 record and missed the playoffs. To be fair there, were a variety of other factors – Carey Price was injured early in the season and played only 12 games. 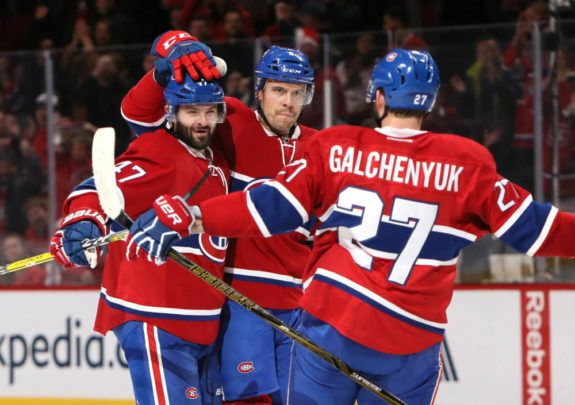 Another injury to Brendan Gallagher and subpar performances from Plekanec, David Desharnais, and Markov plunged the team into a terrible mid-year slump. On Mar. 10, the indestructible Subban suffered a season-ending injury that left the city in a depression not seen since the Pacioretty injury four years earlier. It also illustrated the continuing fan affection for the media-savvy defenseman, despite rumours of a conflict with other players on the team, in particular, the captain. 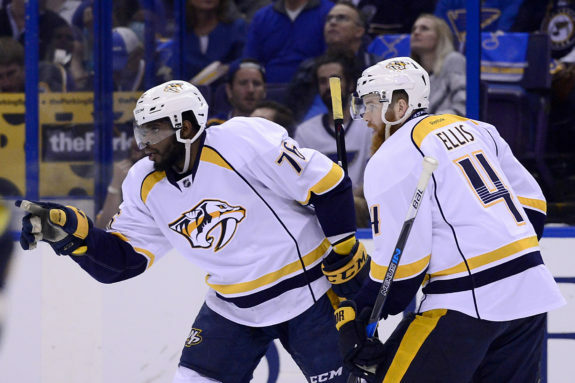 Whatever the situation, rumours of a rift were enhanced further when Subban was traded to the Nashville Predators on June 29, 2016, for Shea Weber, the Predators team captain. After a phenomenal start to the season, the team stumbled after the Christmas break and had one of the weakest records after the new year. Their performance led to the firing of coach Michel Therrien and many were questioning the leadership skills of Pacioretty, who seemed unemotional in press conferences and prone to scoring slumps. After another early exit in the playoffs, the Canadiens entered the 2017-18 season without Alexander Radulov, their star right winger and offensive catalyst, and Andrei Markov, who left for the KHL when contract renewal talks stalled. With decimated leadership, a reduced offense, and the decision to experiment at centre with newly acquired winger Jonathan Drouin, the team stumbled from the start. 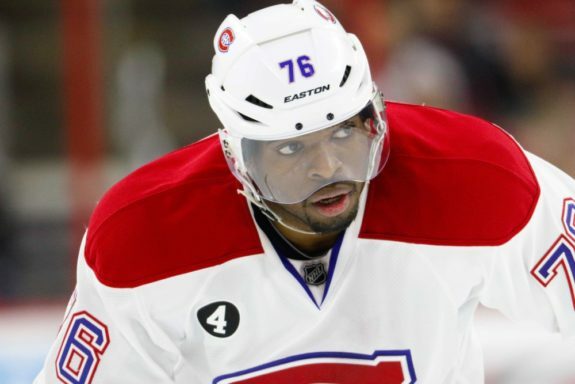 Injuries to Weber and Price plunged the team to the bottom half of their division by November, where they remained for the rest of the season. Pacioretty experienced his worst season since joining the team permanently in 2011 and the debate about his skills as a captain continued to simmer. With a new season a few months away, the Canadiens’ management has to consider the unthinkable – switching their captain without a trade. Losing Pacioretty would be a huge mistake. Despite a rough season, he is still one of the top left wingers in the league. With Marc Bergevin open to making changes and in possession of a top three draft pick in June, look for Pacioretty to rebound offensively. The captaincy is another issue. Free from the constraints of the added responsibility, Pacioretty could concentrate solely on his game again and avoid the awkward press conferences that have convinced fans he’s not up to the task. Who then would be his successor? Shea Weber is a clear choice. A former captain and a non-controversial figure with a strong work ethic, he is respected by both his peers and officials. Even his quiet off-ice persona could be an advantage as there is less of a chance of an incident to undermine the team’s and fans’ confidence in his abilities to lead. So another question begs answering – can this happen without offending the current captain? Surprisingly one doesn’t have to go too far back in NHL history for an answer. 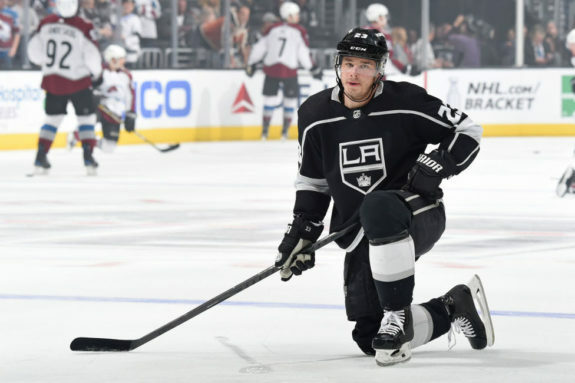 When the Stanley Cup legitimately made its way to Hollywood in 2012 and 2014, a big part of the Los Angeles Kings’ success was captain Dustin Brown, whose hard-nosed style of play was coupled with a reasonable scoring touch. After their second Cup win in 2013-14, Brown struggled offensively, producing effectively half as well as he did earlier in his career. Sensing that both leadership and production was becoming too difficult, the Kings switched captains, replacing Brown with Anze Kopitar. Resentful at first, he accepted his fate with dignity, and, if there was an impact on him emotionally, it was offset by an increase in production as he regained the scoring touch from earlier in his career. There is no way of determining if the change in captains had a profound impact on the relationship between Brown and Kopitar. Given their statistics last year, it seems both men have fared very well and if there are issues with the Kings’ lack of success in the playoffs this year, it might have more to do with a Vegas Golden Knights team that, as of this writing, still has the hot hand in a dream-like season. Can This Switch Work For the Canadiens? He must return to form this year or his market value will greatly depreciate. Asked if a bonafide scorer is more valuable than a potential team captain, I would hazard a guess most NHL general managers would agree. If he wants to stay with the Canadiens, Pacioretty must decide which is more important – status or performance. A true leader, whether he wears a “C” on his sweater or not, knows that in the end, the success of the team should always come first.